Few Paula Peck desert recipes really lend themselves to Summer. A couple of fruit tarts, a mousse or two, and a few fruit tortes are summery as is without modification. Maybe because she spent most summers in France, renewing her tastes and inspirition or maybe she just didnt bother much with the heat of baking in a hot humid Manhattan building before AC was a regular commodity. Whatever the reason, this frozen torte is part of this small exclusive group of her summer desert recipes. Not exactly quick or easy, if meringue is foreign to you, but the construction is fairly simple and the finished torte is impressive. There are two methods used in the original recipe for which I have strong opposing feelings. The first is the suggested baking time of the meringue to ensure it doesn’t brown. Though technically incorrect, in my opinion the baking time for meringues takes long enough without having to worry about making sure it maintains pure white and doesn’t brown. In this particular instance, I don’t mind if the meringue is slightly tan on top. It speeds up the baking/drying process and has little effect on the taste. The second method, which I agree with, is adding gelatin to whipped cream. This works well to stabilize whipped cream if using it like a frosting, which in itself is an interesting technique that I’m not quite used to. Substitute powdered agar-agar or vegetarian gelatin for vegetarians. 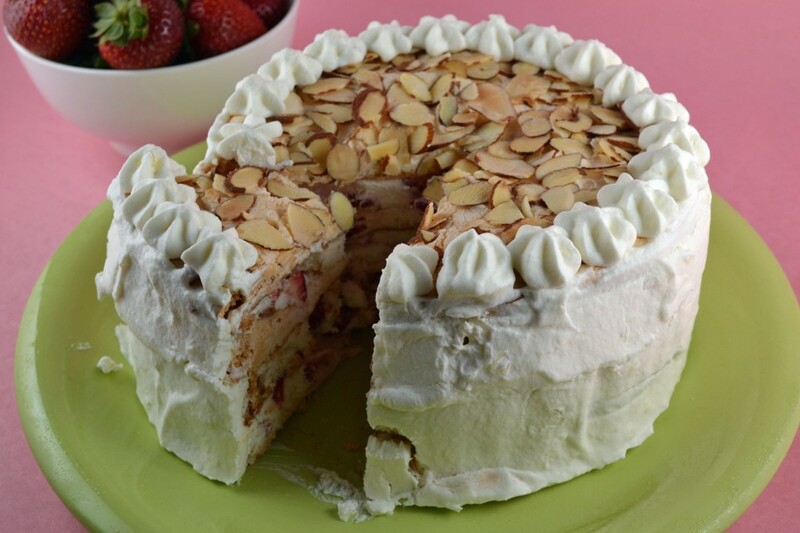 A last point that needs to be emphasized is to serve the torte frozen. It just doesn’t taste the same when it begins to thaw. A finished frozen slice should taste creamy and light, like strawberry shortcake and meringue cookies smashed together in a giant sandwich then hidden beneath a layer of silky cream and frozen to combine the textures into a cool summer treat. Sprinkle strawberries with 1/4 cups sugar and set aside. Combine egg whites, cream of tartar, salt, and vanilla extract in the bowl of a mixer. Beat at medium speed until egg whites hold soft peaks. Gradually add 1 cup sugar, a few tablespoons at a time, beating continuously until stiff peaks. Preheat oven to 350 degrees. Line with parchment paper or grease and flour two large baking sheets. Trace four circles in flour, each 6 inches in diameter. 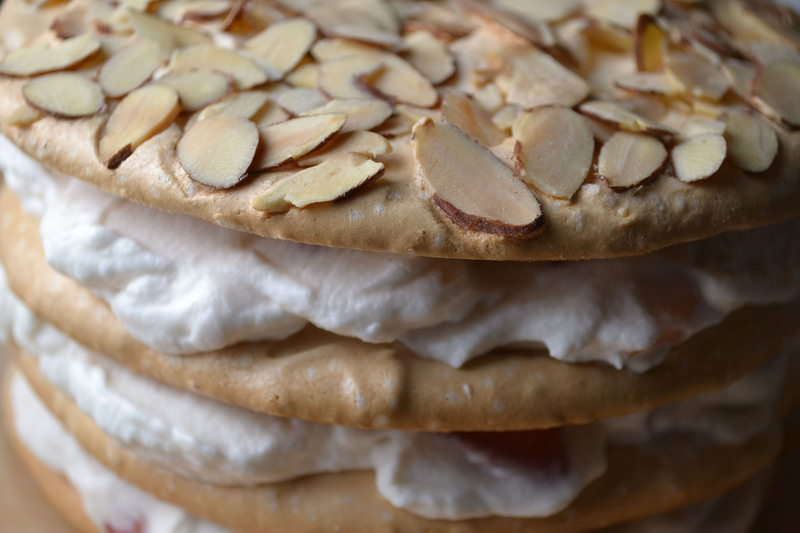 Spread a thin layer of meringue within each circle. Sprinkle one layer with sliced almonds. Bake meringue layers at 325 degrees for 10 minutes. Reduce oven to 300 degrees and bake meringue until puffed and cracked, about 50 minutes. Turn the oven off and prop the door open. Let cool in oven for 30 minutes until room temperature. Drain sweetened berries. Combine with about 2 1/3 cups of whipped cream. Working as quickly as possible to prevent meringue from softening, sandwich layers with whipped cream mixture. 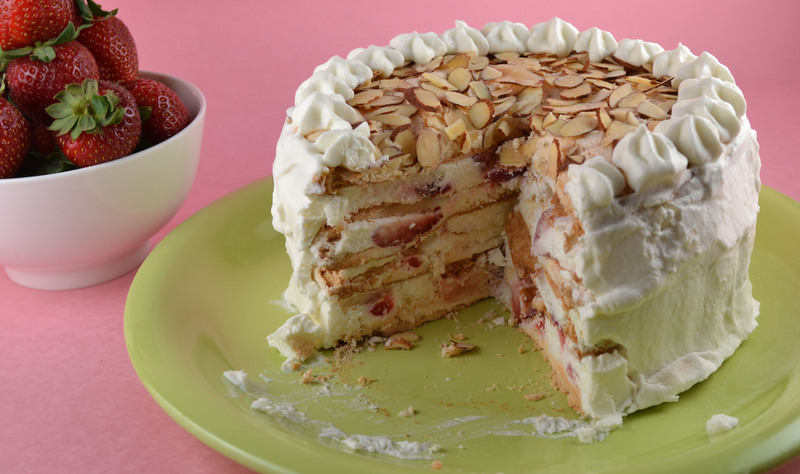 Place the almond studded layer on top. Place in the freezer for 2-3 hours, or until cake is frozen. Spread the remaining whipped cream around sides. Place again in the freezer. When sides are frozen, the torte can be wrapped for freezer storage for up to 6 weeks. Wow. Your grandmother really knew how to bake. This looks fabulous, albeit sweet, and I know because I think I am drooling!